When I visit post offices, I don't just take photos and collect postmarks. Well, usually I don't have the need to do anything else, aside from possibly bantering with cool folks, but occasionally there's more work to be done. I note these changes because, in my view, providing superior customer service and best engaging and maintaining existing customers is a key to maintaining revenue and assuring the future success at USPS. Hence, I thank the Philadelphia Metro District and patient staff at the Philadelphia Post Office for listening to me and working to improve the customer experience at their locations. It should be noted that by and large I've dealt with highly competent staff and friendly offices. The following three changes were implemented to address aberrations. It's not the clerks' fault, a fact that I expressed to nearby agitated customers -- staff at all levels has been forced to cut back to save money. When brought to the attention of Philadelphia Post Office management, it was agreed to that management would monitor the situation and assign a supervisor to visit the station on a more frequent basis to ensure the wait times remained acceptable. The Franklin Mills Mall is huge. HUGE. 1,600,000-square-feet huge. Fortunately it has a post office! 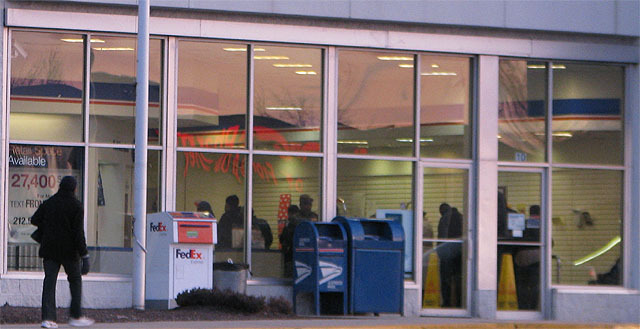 Not only that, but as a function of USPS's lease with the mall (as it is at many such locations across the country) the Franklin Mills post office must be open during all mall hours. Presently those are Mon-Sat: 10:00am-9:30pm; Sun: 11:00am-7:00pm. For you Googlers who are trying to find the place -- it took me 25 minutes -- it's on the east side of the building, at the blue entrance. Fortunately there's a little blue-and-white Sonic Eagle logo there! In any case, the Philadelphia postal system is quite uncommon and impressive as it has TWO USPS-operated facilities that offer customer window hours seven days a week. I think it's a mark of pride. The bizarre thing is that, for the first time I'd ever seen in then-2,500 post offices, they weren't offering full services at the time. After 1 p.m. (for a while changed to 6 p.m.) the location would not accept packages; the postmarking devices were locked up; and all they could do were sell stamps and money orders. This was true for all of Sunday as well. I inquired and that's apparently just the way it had always been done. The reason is that there was no dispatch after 1 on Saturday or at all on Sunday; USPS didn't want it to appear as though the packages had been delayed. But if you want to mail a package, and it will arrive at the same time anyway, wouldn't you just want to send it and not have to return on Monday? The packages could always be stamped "Received After Final Dispatch." And what's it costing the postal service if the location must be staffed full hours, anyway? Good news: Two weeks ago the District Manager agreed to ensure that the location offered full services during all business hours! I think it would be apt to use this as a demonstration of commitment to customer service -- imagine, two full-service offers, seven full days a week! Seriously, why not get the word out? I'm sure the mall would appreciate it, too. I hope that this raises awareness toward the availability of postal services at Franklin Mills and draws more customers to utilize this location at their convenience. I sent the below letter to my dad. I put a nice stamp on it, but as you can see both the letter's origin and date of mailing are completely illegible. "The situation you described was brought to the attention of [the] Senior Plant Manager ... He has directed the Maintenance Department to inspect the print heads on every machine and correct any deficiencies. This course of action will insure cancellations are legible." Based on the envelopes I've received from around the country, this should be common practice everywhere in the country -- the issue is prevalent. Generally speaking, the Postal Regulatory Commission (PRC) Contact page is INCREDIBLY useful toward resolving any postal issues you might experience -- if, in fact, you have any that can't be resolved at local levels or if you just don't know who to contact. Just be sure to be accurate, be precise, and do be polite! Good work, Going Postal! The public thanks you! You will indeed exceed our expectations if you keep the Franklin Mills office open until 7:30 on Sundays, as your letter says, when the mall closes at 7:00.